The calming effect of massage for children with ADHD has already been recorded in several studies. 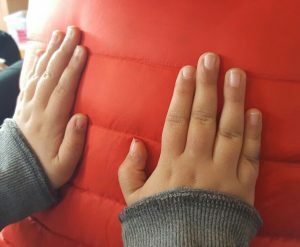 The most significant research into positive touch has been carried out by the Touch Research Institute at the University of Miami. Results show that massage therapy benefited children and adolescents with ADHD by improving short-term mood state and longer-term classroom behaviour. Another study involved 30 children and adolescents between the ages of 7 and 18 diagnosed with ADHD. The children were randomly assigned to a wait-list control and a massage group. The latter group received massage therapy for 20 minutes twice per week over the course of one month. Mood state improved for the massage, but not the control group, based on smiley face and thermometer scales. The massage group also improved in classroom behaviour in the areas of anxiety, daydreaming and hyperactivity. This research is supported by the work of Kerstin Uvnas-Moberg, a Swedish researcher and author of The Oxytocin Factor, Tapping the Hormone of Calm, Love and Healing who believes that the feel-good effect of touch is linked with the release of oxytocin and other mood-enhancing chemicals during gentle massage. 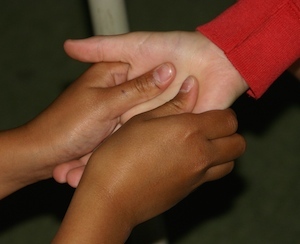 Kerstin suggests that this release of oxytocin into the bodies of those giving and receiving gentle touch could be one of the reasons why touch has such a positive impact on bringing feelings of calm, empathy and harmony to the atmosphere. The role of oxytocin in bringing calm and peace to active children is central to the work of Story Massage. Nurturing massage combined with creative story telling can have many benefits including promoting sensitivity towards others, raising self-esteem and confidence, and bringing fun and laughter into the day. Story Massage may help complement other ‘tools’ in helping parents and children develop resilience and coping strategies. It is suitable for children of all ages and abilities. 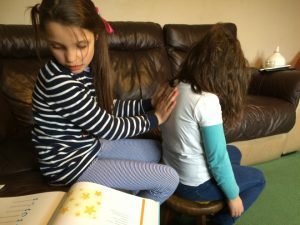 Leanne Brown, mother of four daughters including one with ADHD, writes about using Story Massage within her family. 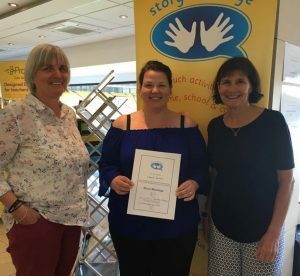 She has won a Best Practice Award for her work with sharing Story Massage in her home and with other families experiencing the same challenges. It is a good idea to start slowly and gently, maybe with a simple stroke on the back or hand at bedtime. Then gradually build up the massage at the child’s pace focusing on a story or song that would hold their attention. Keep the massage time short and frequent – through clothes if that is easiest. Our Story Massage book Once Upon a Touch…Story Massage for Children has easy to follow instructions for our 10 basic massage strokes plus some tried and tested Story Massages to try with children. We run accredited training courses around the country to help teachers, teaching assistants, health professionals and parents learn Story Massage. We also have a popular online training course which can fit into your lifestyle. You can find all the information here: Story Massage Training.